The Peanut Gallery- 2011 Review. 2011 is coming to a close today- it was the wettest year ever officially recorded in this part of Ohio, and I’ve missed many a photography session due to rain or cloudy weather (particularly since this past summer ended). Things will almost certainly be better next year (he said, fingers crossed), and instead of a post about an old hike I took earlier this year, I thought today would be a good day to review some of the photos I’ve taken right outside my front door in the past 12 months. I live in an apartment with a walled patio and some maple trees in the yard area. 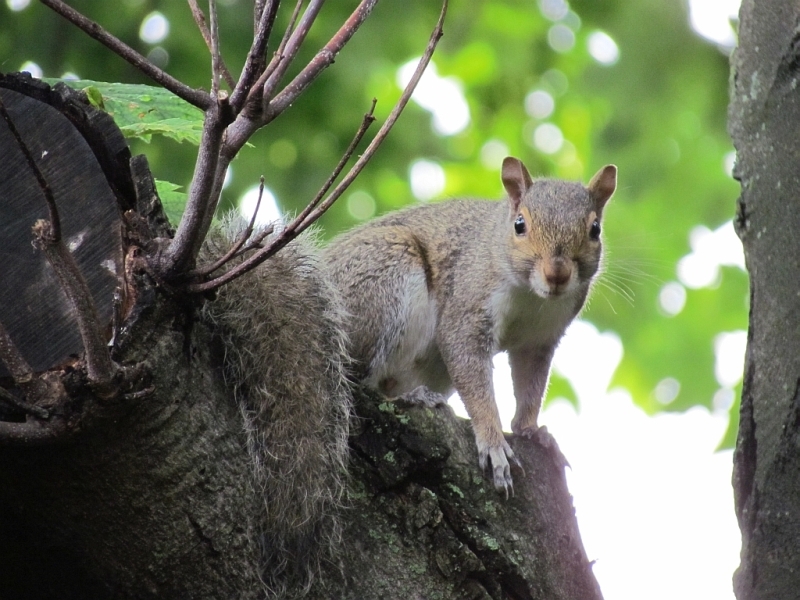 As you know, I enjoy nature, but I’ve avoided having a permanent bird feeder for a couple of reasons- determined squirrels, and a local hawk that makes regular rounds. I understand that hawks need to eat too, but I hesitate to offer up convenient bird meals by way of a prominent bird feeder! Instead, I’ve compromised a bit. 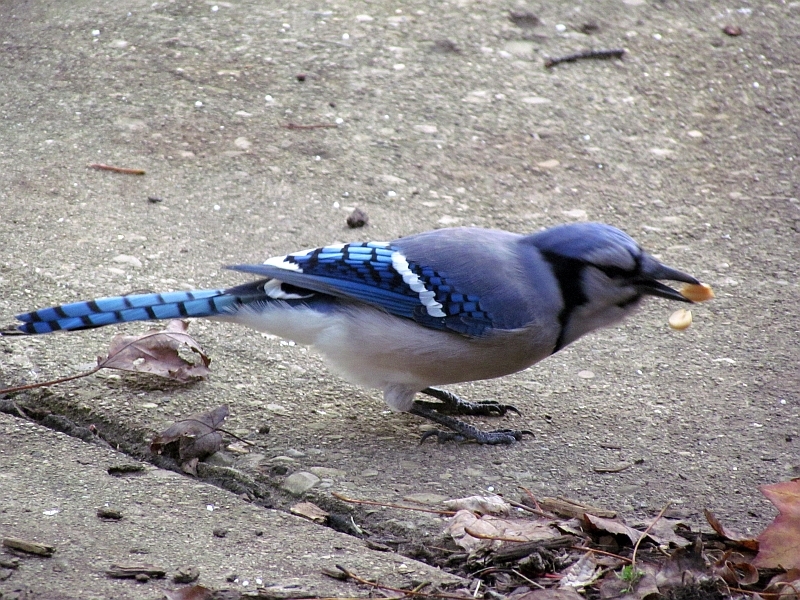 I put out occasional unsalted peanuts for the local wildlife, being careful not to overdo it- no need for hordes of critters that my neighbors may not appreciate. 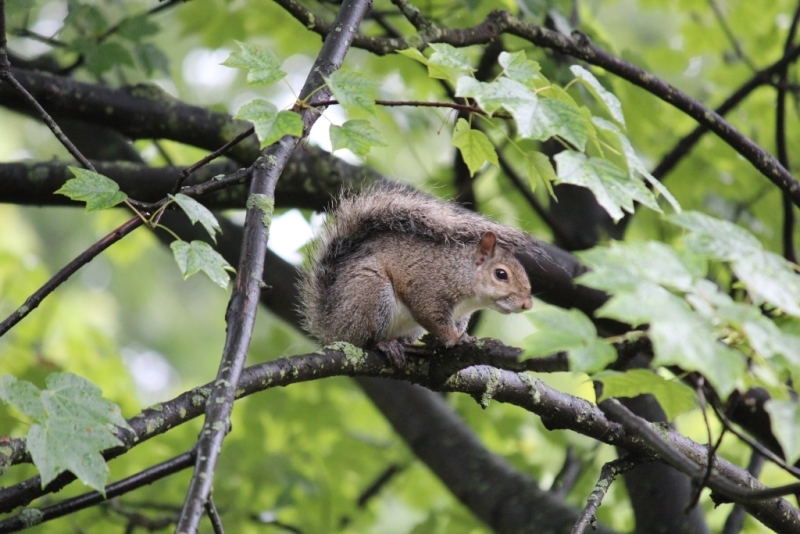 Grey Squirrels are frequent peanut eaters in my area- it’s fun to note the differences in personalities between individuals. 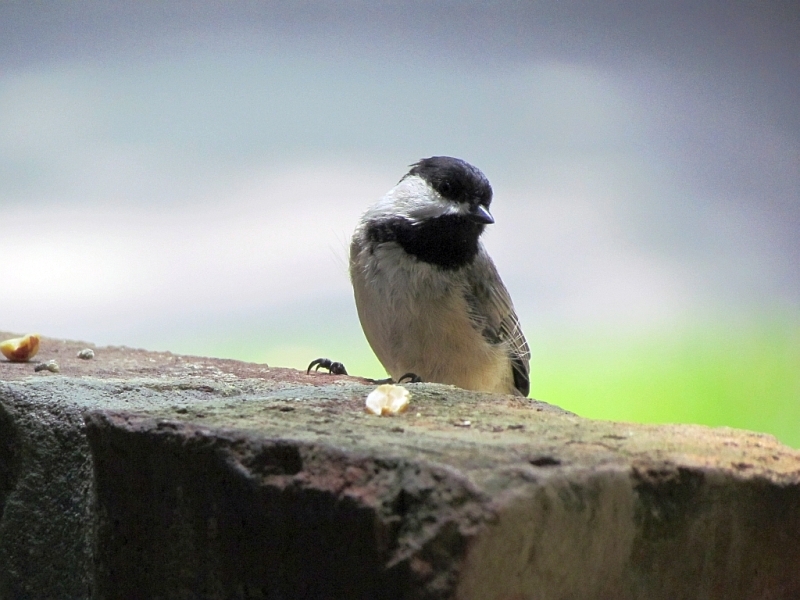 Some are shy, others bold- to the point of nearly coming inside the apartment when hungry- and they are always entertaining. Some can be distinguished by how they fold their front paws. 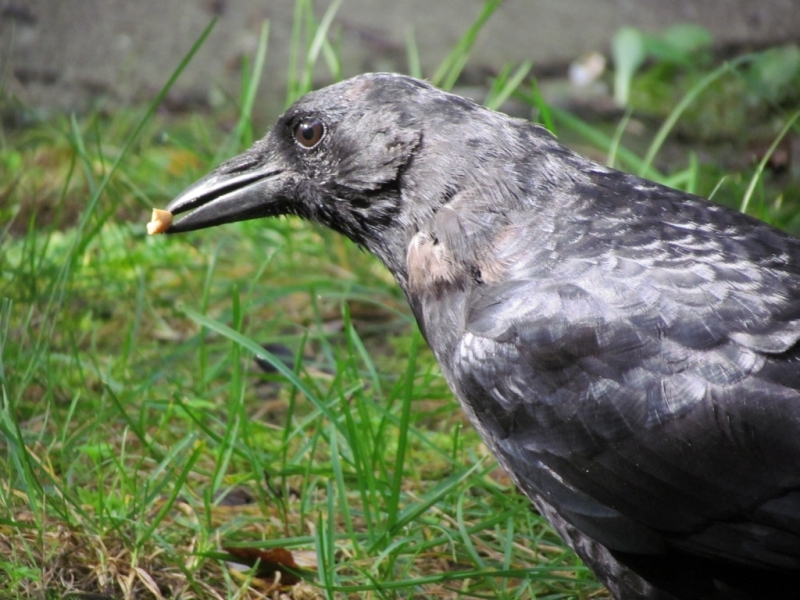 Young ones join adults during the year, and they work out who is who in the pecking order. 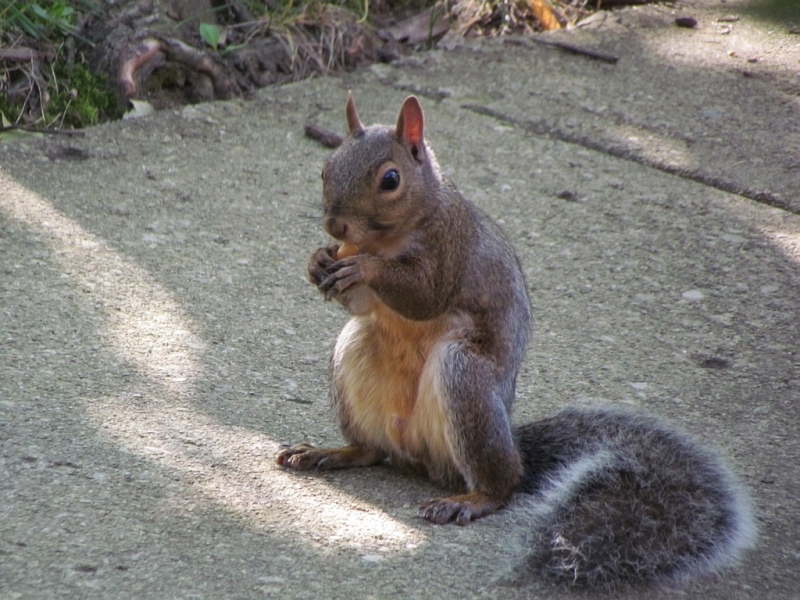 Some know the trick to carrying more than one peanut away, others haven’t quite figured that out yet. 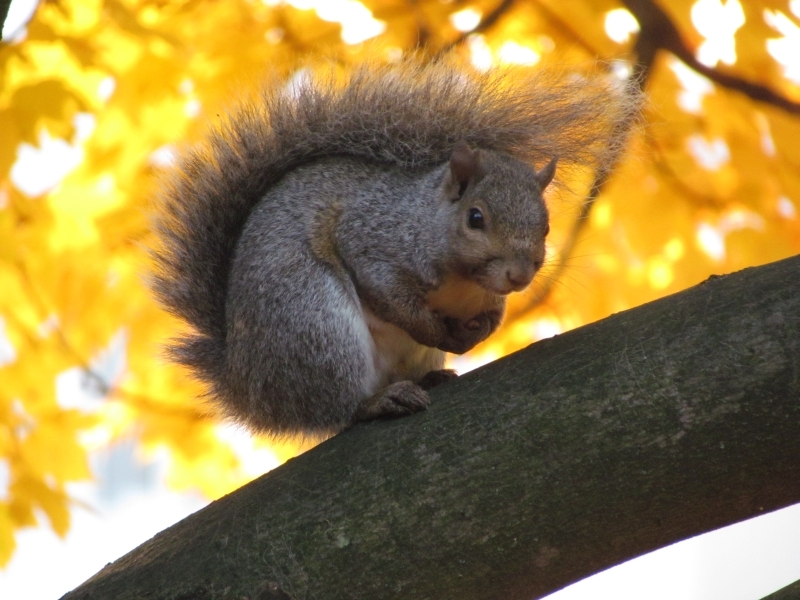 All like to bury peanuts in the autumn and winter when not immediately hungry. One little squirrel tries to use its tail as an umbrella in the rain. I try to have a peanut in my pocket when I walk out to my car in case one of these fuzzy fellas recognize me and comes up to me, hoping for a treat. There’s a yearly turnover in the local population- the apartment complex where I live will live-trap them and release them a few miles away in the hopes of keeping the population under control. 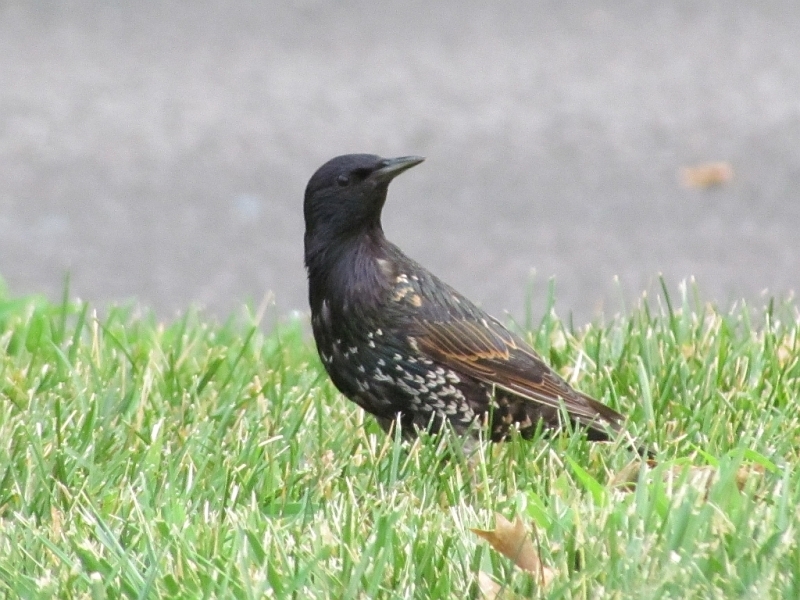 A pair of Starlings were nesting across the street on the facade of an apartment building- they’d drop by sometimes to grab a peanut or three and wolf them down. Starlings are no-nonsense feeders who get right to the point. 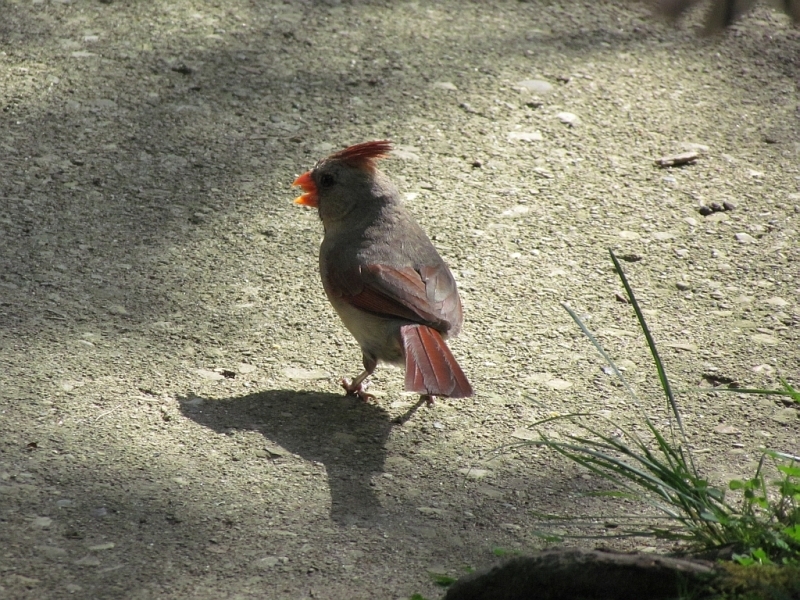 They often have an odd squeaking song, but they can surprise you by mimicking other birds on occasion- or even human whistles. 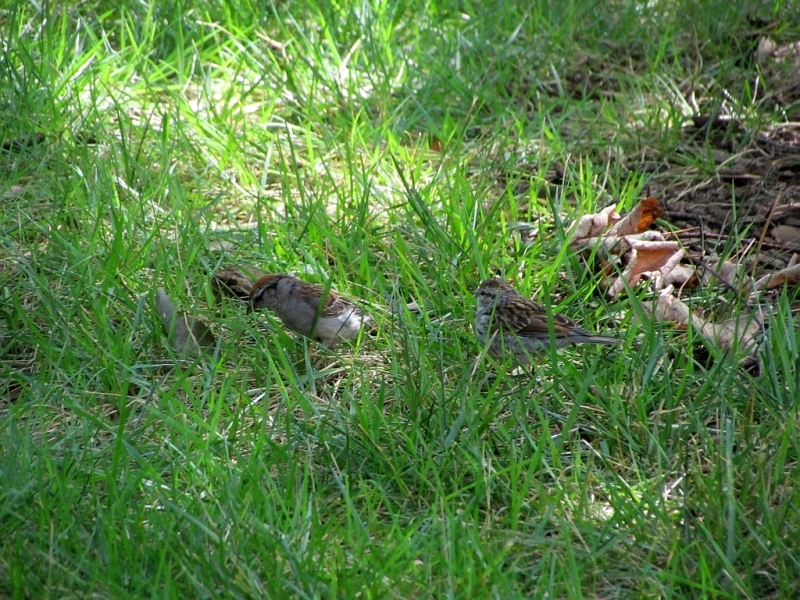 House Sparrows are often taken for granted, but they are social and entertaining to watch. 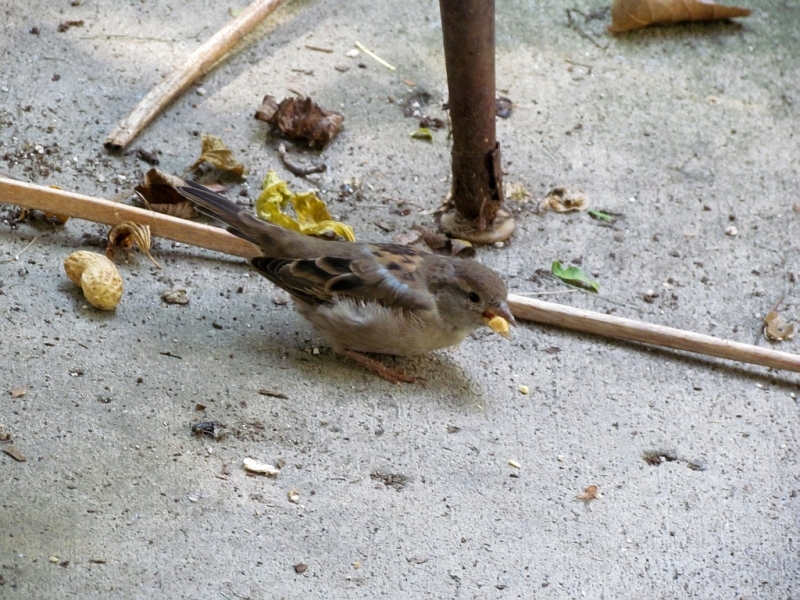 There is one female that will come right up to me while I am putting out peanuts on the patio- she waits patiently for me merely a few feet away to give her a peanut. 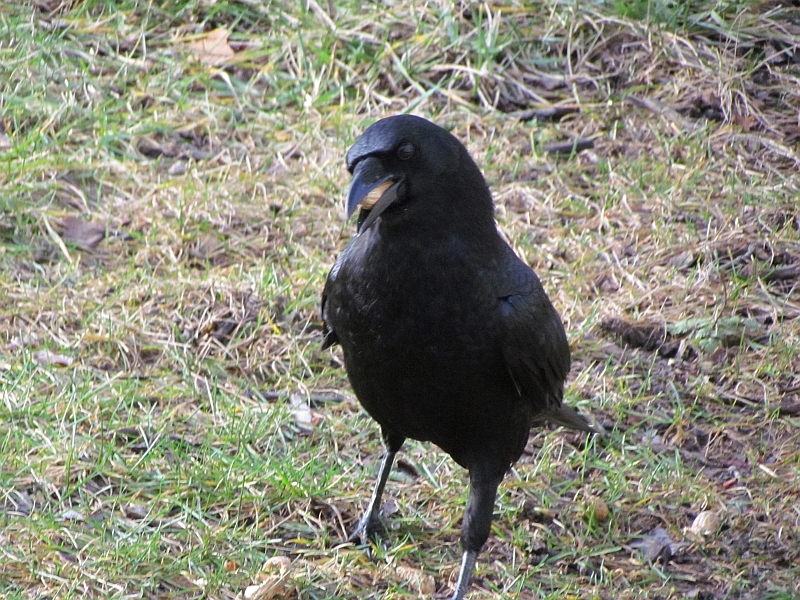 A young male- perhaps her mate?- is also getting tame around me. 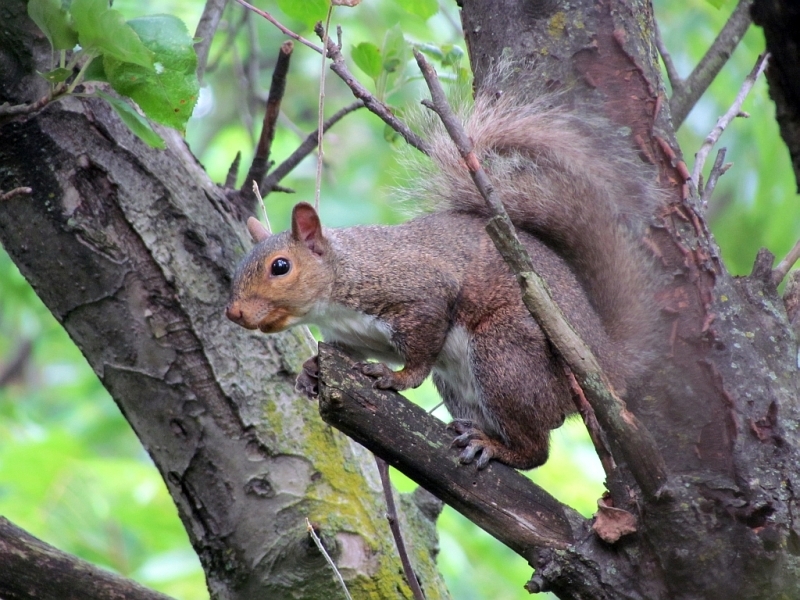 Others are more skittish. They will sit in the bush right outside my front door, waiting for a peanut treat. 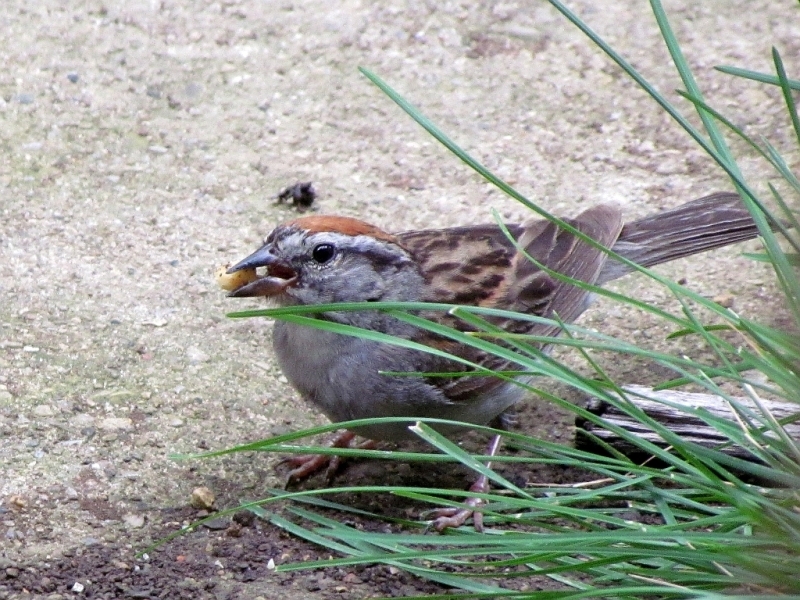 I had a Chipping Sparrow (probably a pair of them) hanging around this summer too, the House Sparrows would sometimes scare it off, but it would grab a peanut and work at it, breaking it down into bite-sized pieces. 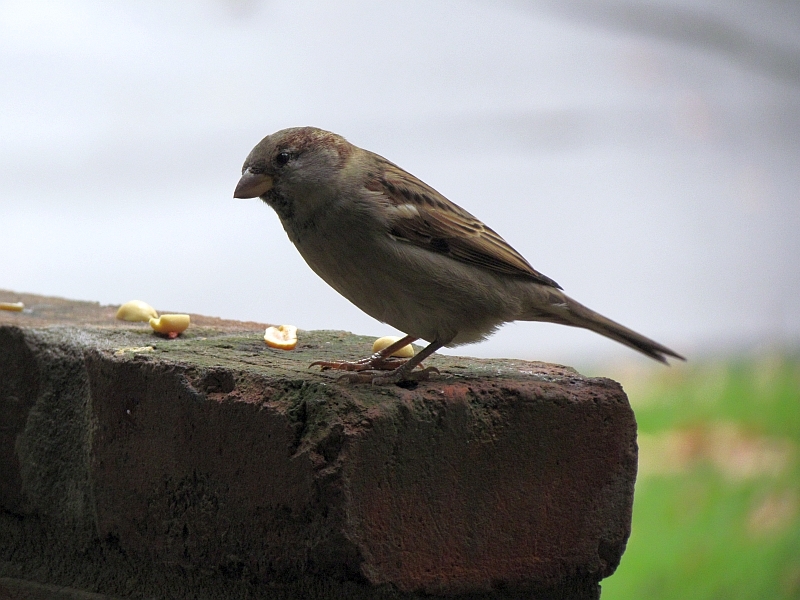 It seemed to have a harder time doing this than House Sparrows, who have more robust beaks for cracking seeds. 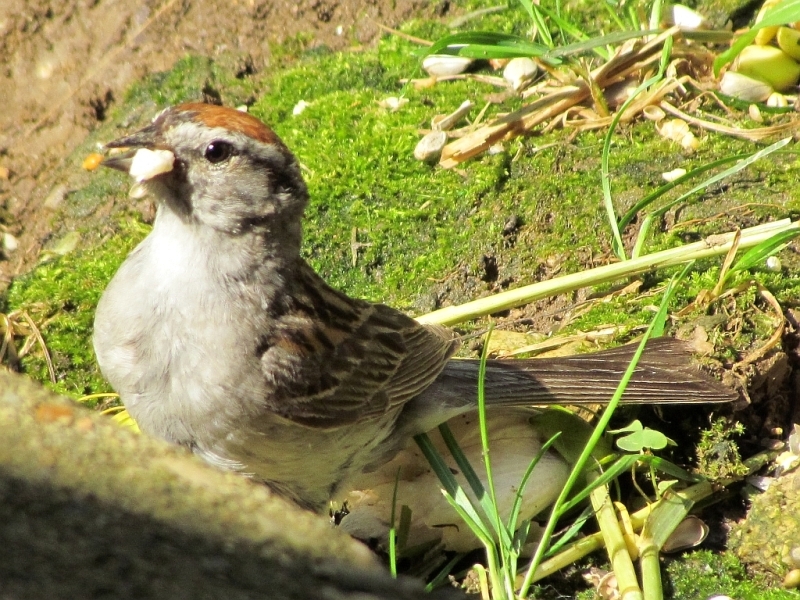 It brought a young juvenile Chipping Sparrow around after the nesting season. I always enjoy its pleasant song in the warm weather. 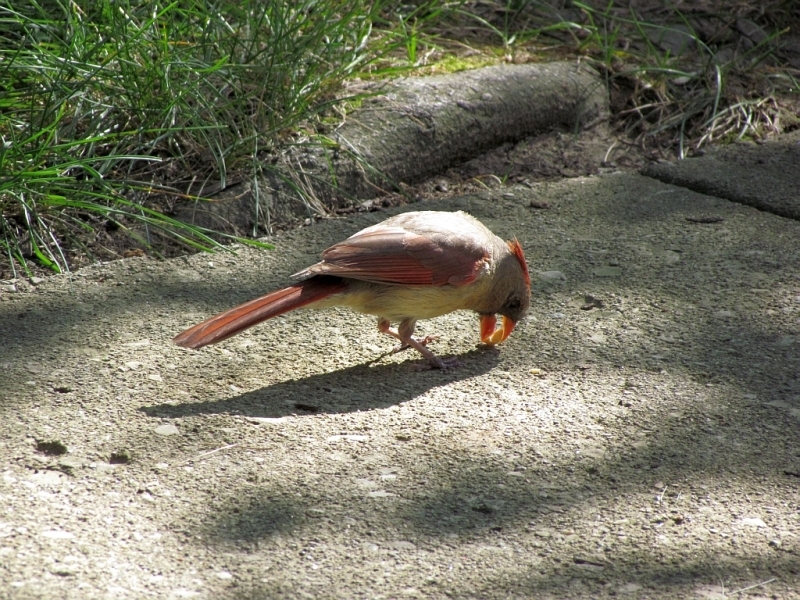 I had a pair of cardinals make daily visits looking for peanuts in the spring and summer while they were raising young. Another male would sometimes come by, but it seemed there was a pecking order involved, and the regular male would ‘see him off’. The pair would come, often early in the morning and also right before twilight, and make their musical chipping sounds while they sat in the bush. 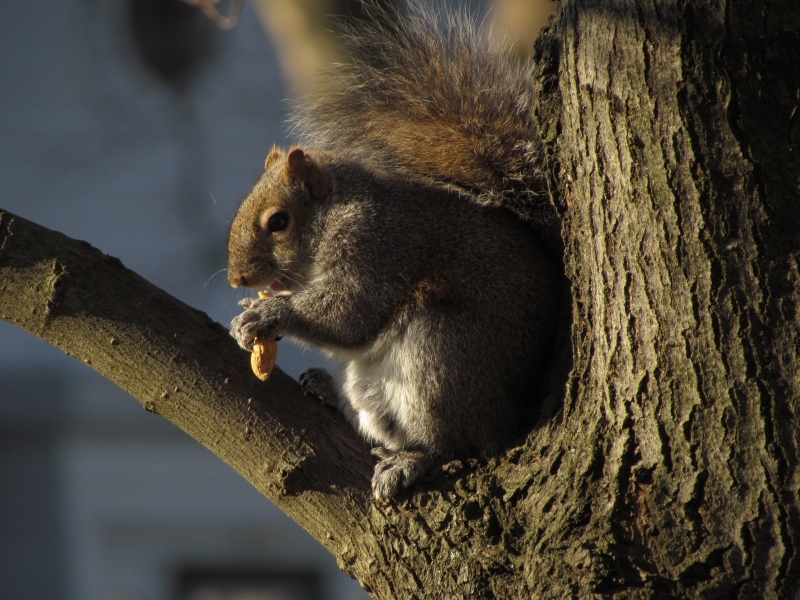 I’d toss them some peanuts- they got fairly tame. 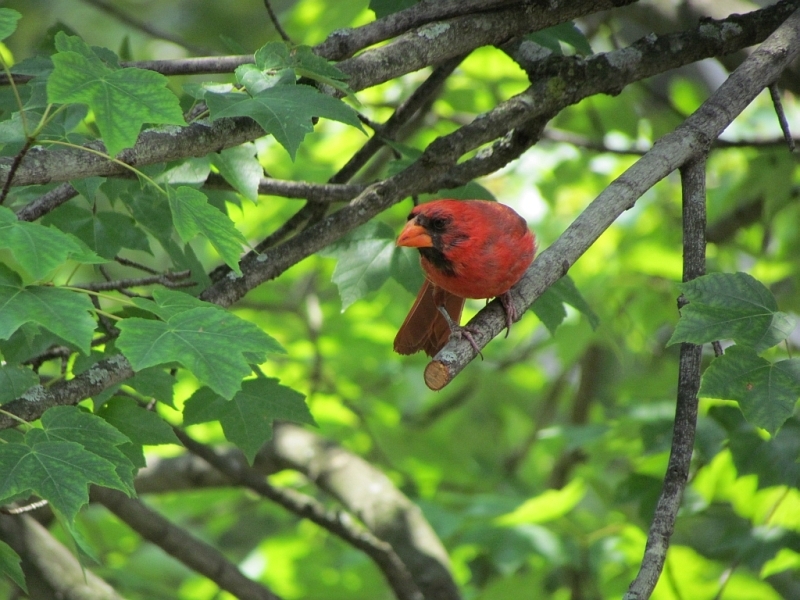 In the autumn and winter, cardinals tend to flock together, and so I rarely see them now. Every once in a while though, I’ll hear that rapid musical pinging and open the door and sure enough, one of them has returned for a visit, as if to say, ‘I used to come here every day when the weather was warm!’ The last picture in the following series was the female who showed up just a couple of days ago for a rare visit before going back to her cold-weather flock. 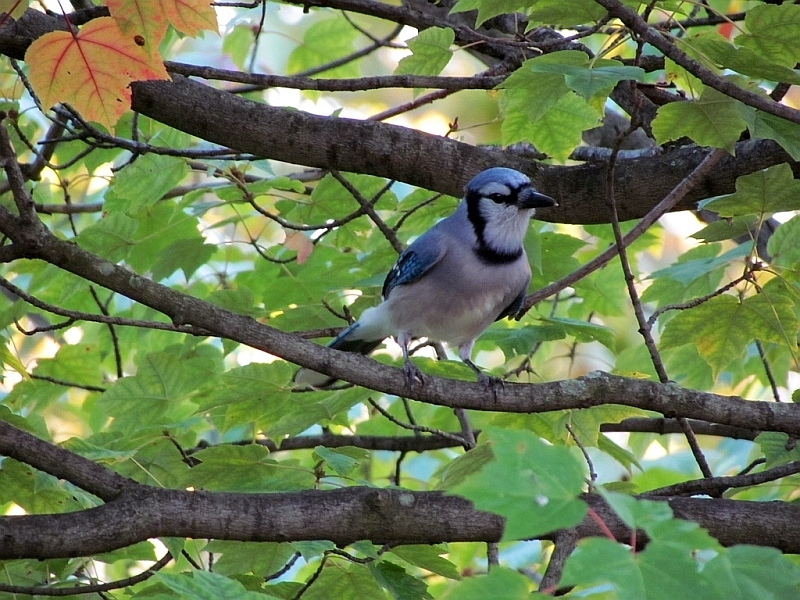 Blue Jays love to announce their appearance on the scene quite loudly. They’ll make sure you know that they’re here, and they are hungry! You want peace and quiet? Better bring out the peanuts, buddy. 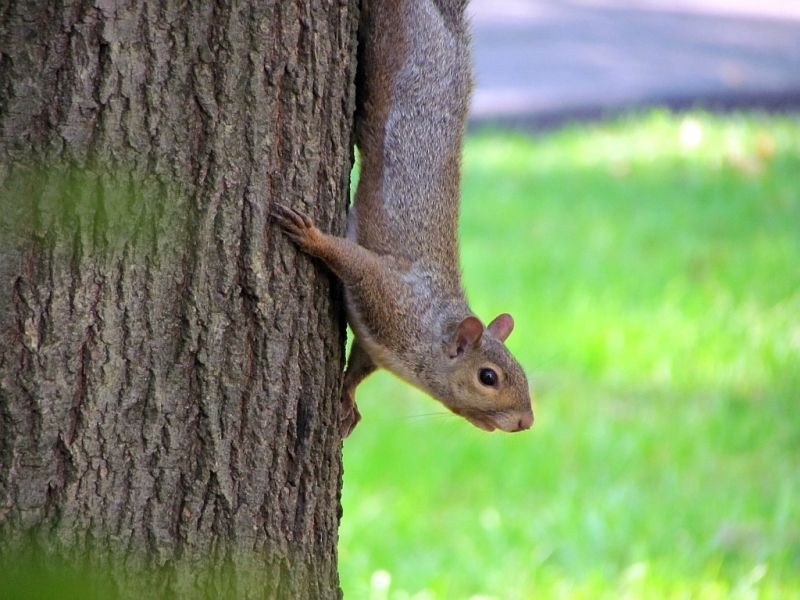 They’ll often swoop down fearlessly, scattering other birds- squirrels are the only creatures I’ve seen stand up to them. Entertaining and infuriating, these birds are also quite intelligent- I’ve seen them hiding peanuts in the grass and placing a fallen leaf on top to disguise their location. 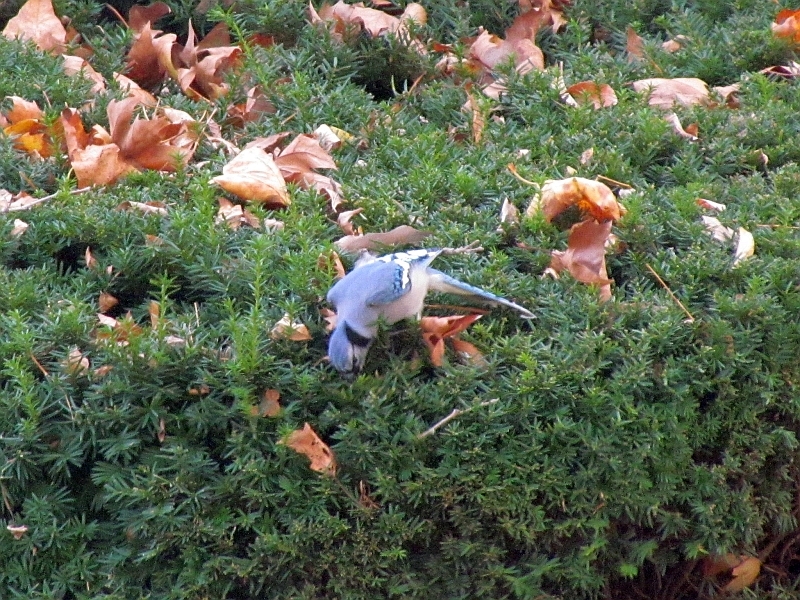 The last picture in the series below shows one hiding a peanut in an ornamental shrub. Smart birds! 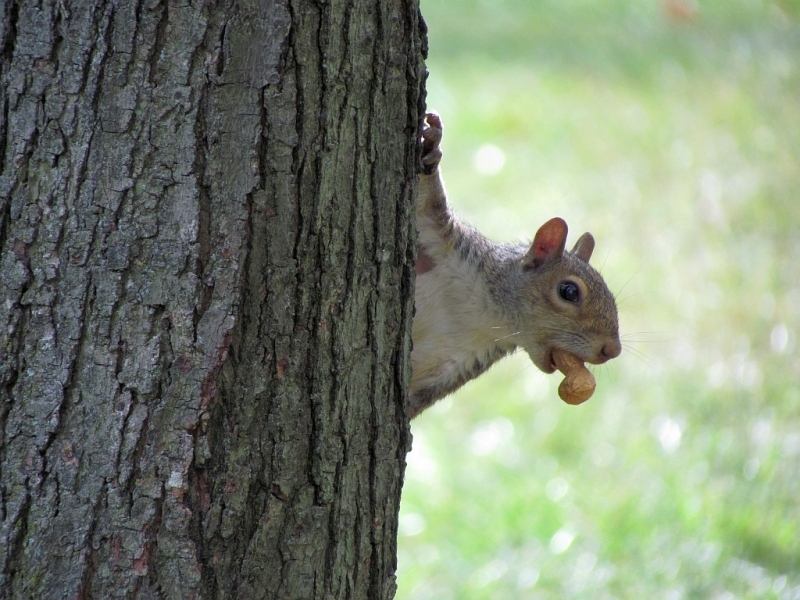 It’s fun to watch them carry up to 3 peanuts at once. 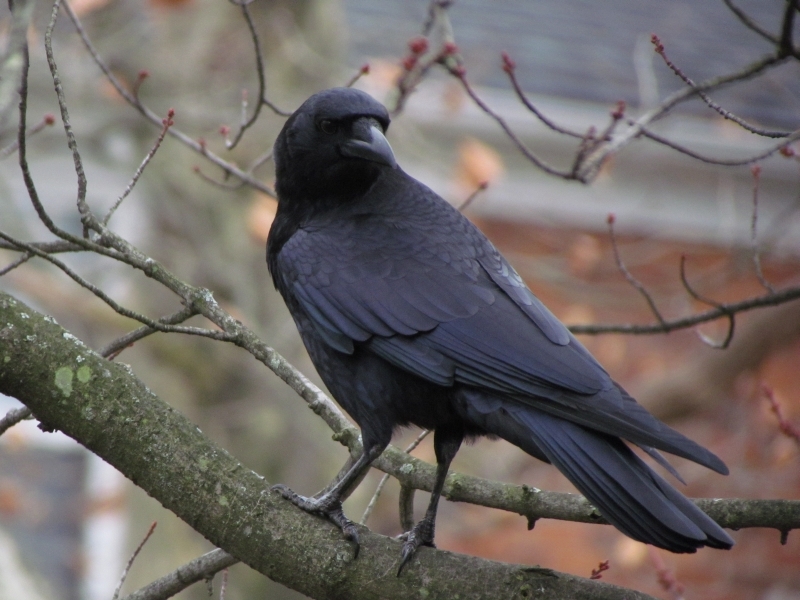 Crows, related to Blue Jays, are also very intelligent birds. 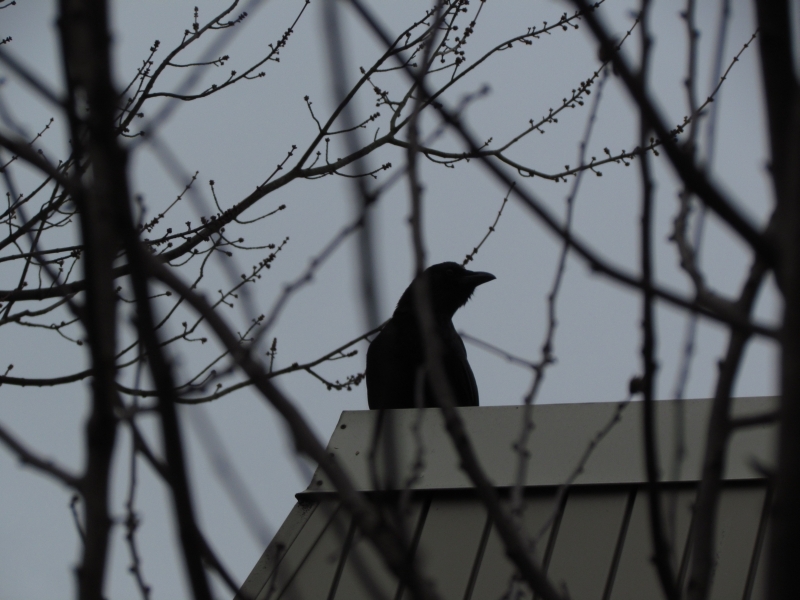 When I grew up in a small rural town, Crows were wary of people. 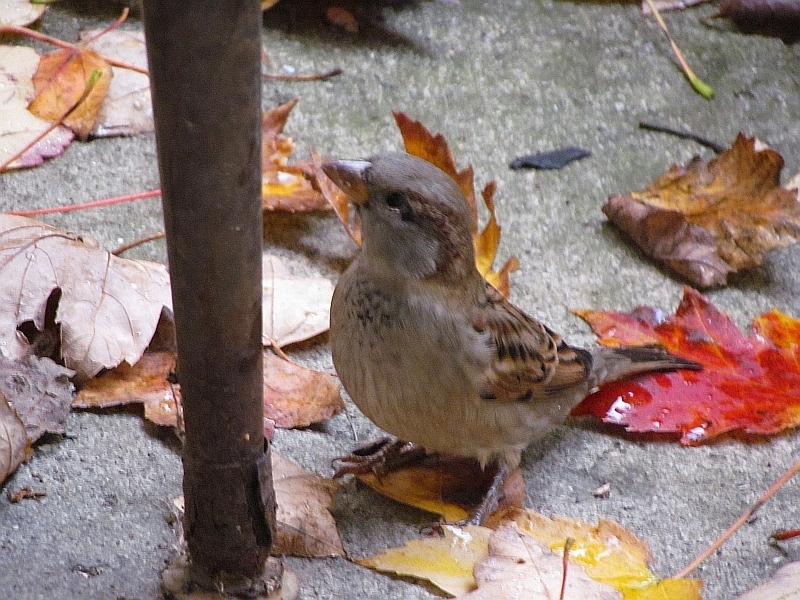 Now, they are sometimes city birds, and can be fairly tame. 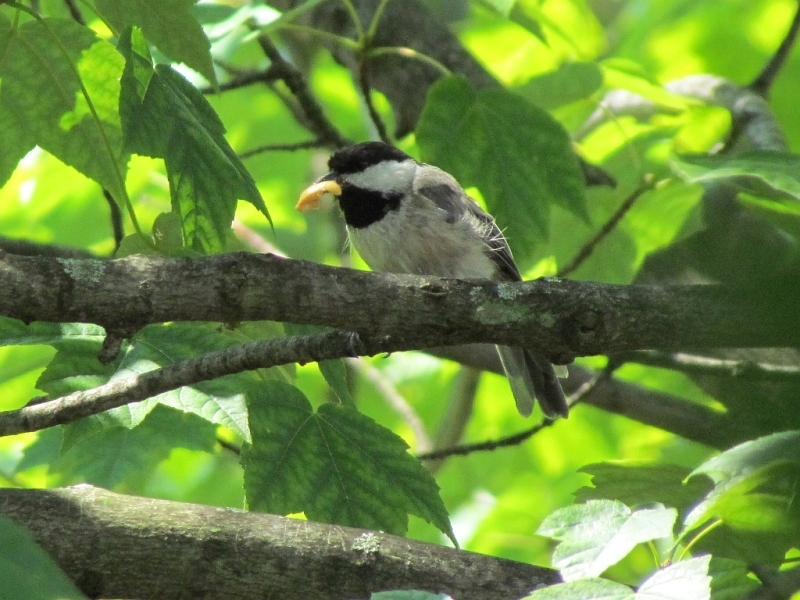 They spend quite a bit of time figuring out how they can carry the maximum amount of food off in their beaks, which is quite entertaining- they often start off half-swallowing one so that they can pick up another one or two in their beaks (seen below in a couple of photos). 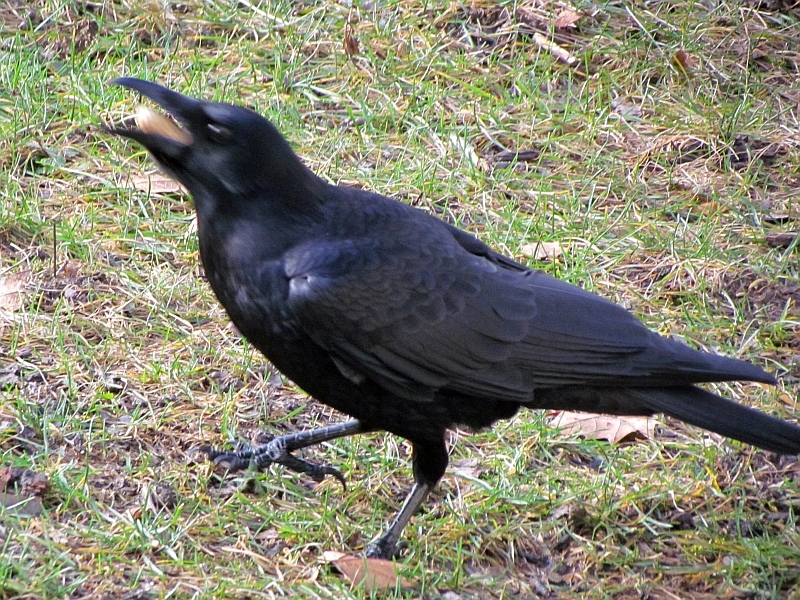 They’ll often belt out their loud ‘caw’ call to announce their presence. Occasionally they’ll made stranger sounds, meaning who knows what, or will caw their heads off while bobbing their heads up and down. 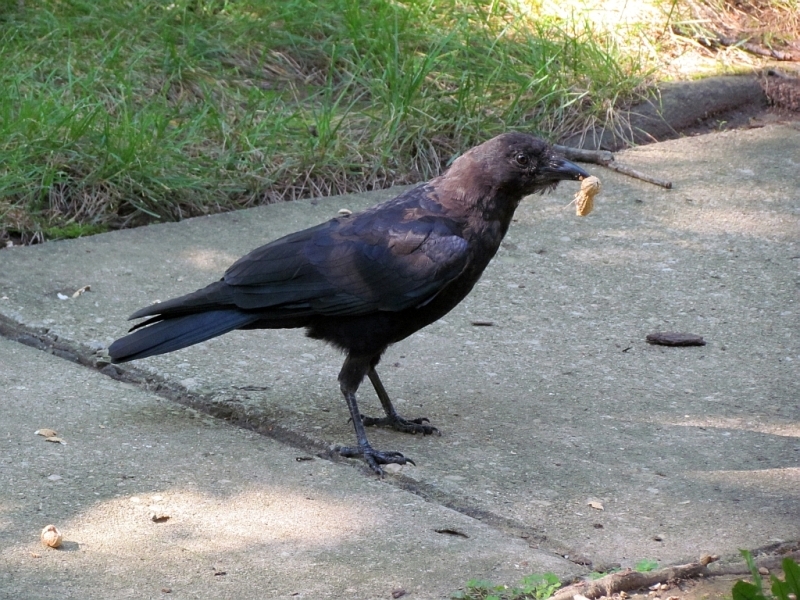 Many a time I’ve walked to my car or walked around the neighborhood and these birds will obviously recognize me and follow me, waiting for a tossed peanut (I always try to have a peanut or two in my pocket for them). 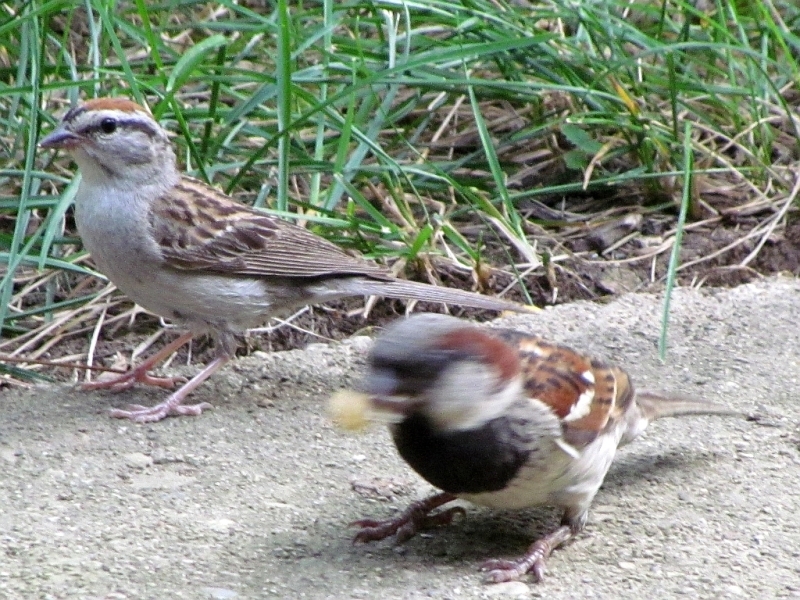 These birds have definite personalities. 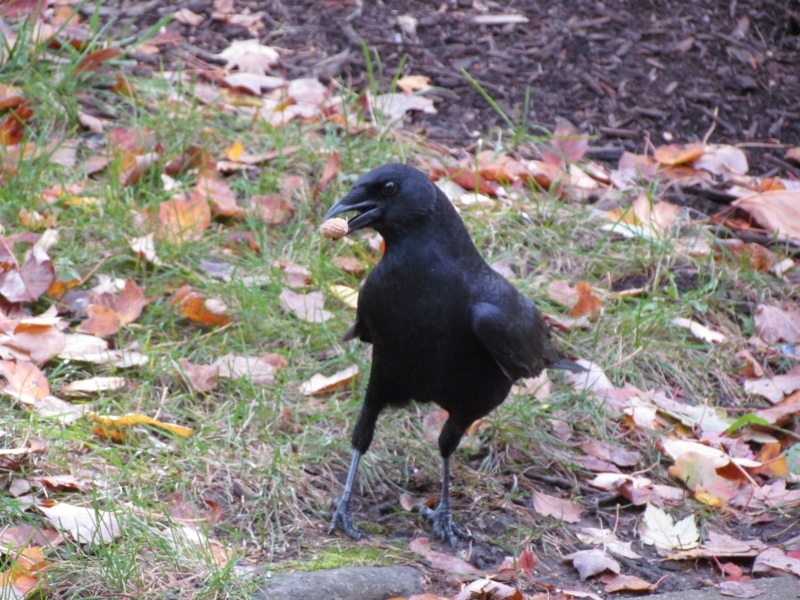 One is quite skittish when grabbing a peanut from the ground, almost as if it’s a trap (seen in the photo below, leaning away from where it just picked up a peanut in the grass)- I bet it had a bad experience sometime in the past. Another likes to sit on the roof and wait for me to open the door (also seen in a photo below). 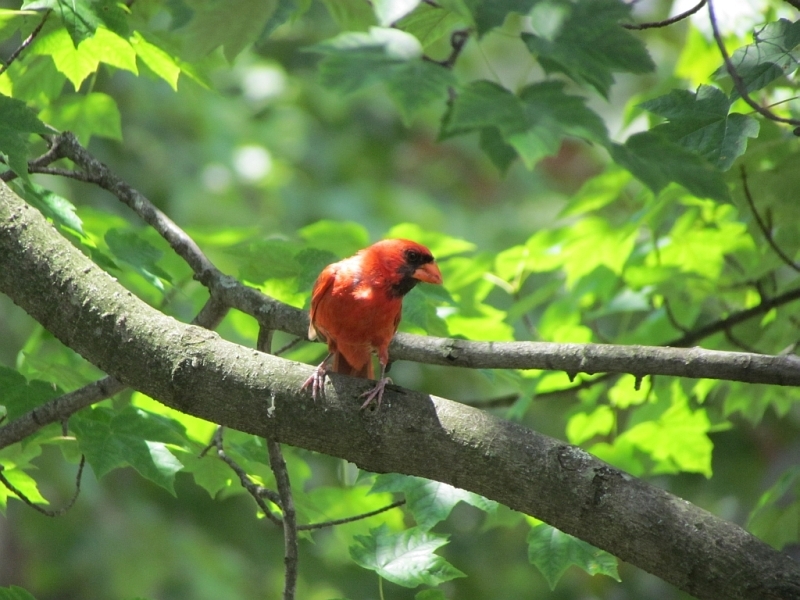 These birds will often be seen in small family groups of from 2 to 6 birds. 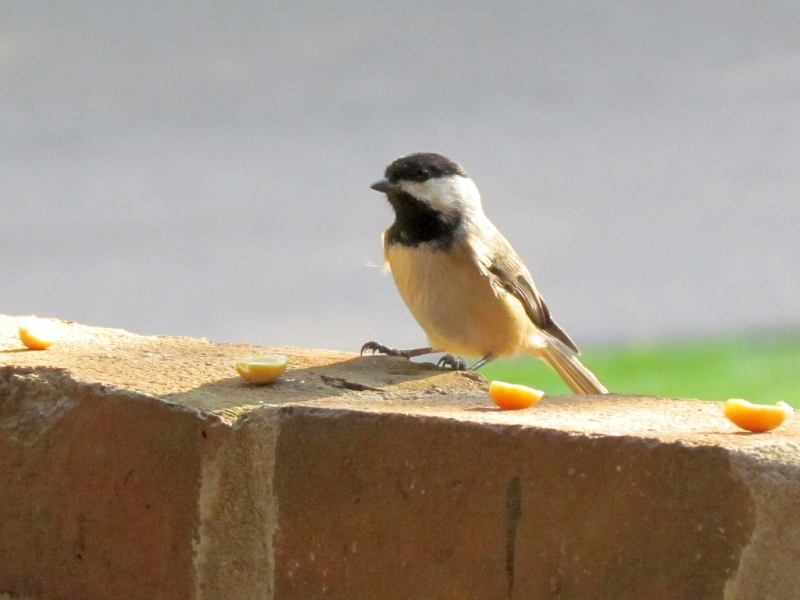 Last but not least, there are 1 to 3 Carolina Chickadees that are regular cold-weather visitors to my patio. I’ll hear their ‘dee-dee-dee’ call from the trees out front or from the bush next to my front door. 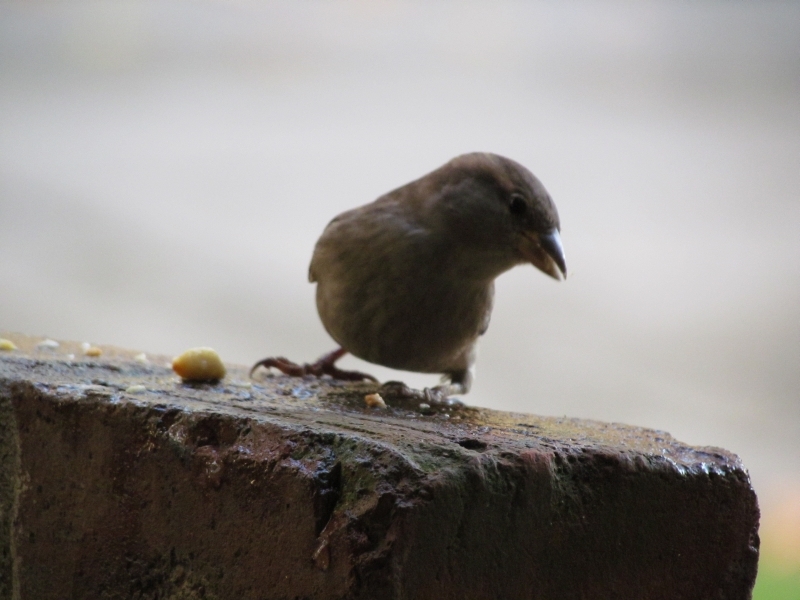 These tame little birds will often come down one by one and get a peanut from the garden wall while I am only a few feet away from them, they’re so used to me now. They’ll often study the available peanuts carefully, selecting the best one that suits them. 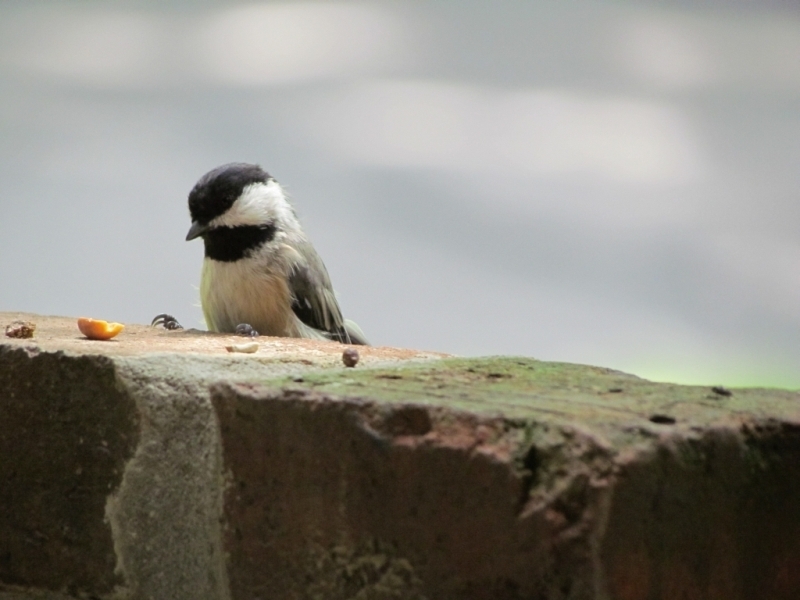 I enjoy watching them peck at a peanut that they’ve carried up into a maple tree while holding it carefully by their toes. Happy New Year everyone! May you and yours have a wonderful 2012! And many thanks for visiting my humble blog! Great shots! 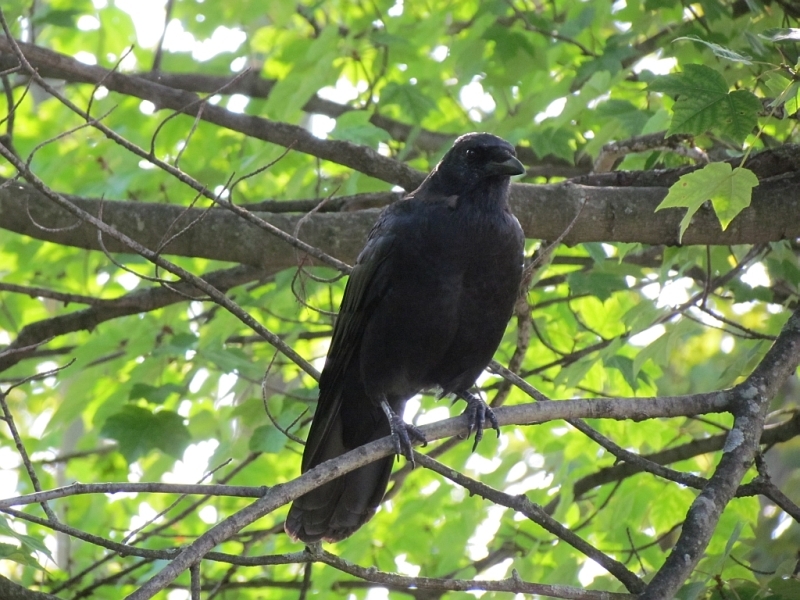 Especially of the crows, it is very hard to get the exposure right on an all black bird, excellent job! A wonderful way to wrap up the year, thanks and good wishes for 2012! I love your peanut gallery! 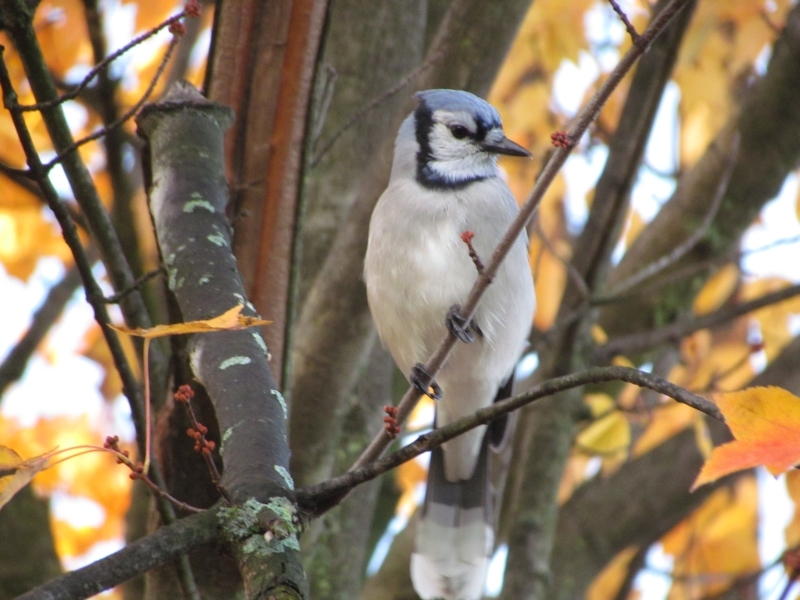 When I put peanuts out, the Tufted Titmice spirit them away before anyone else is aware of them! Don’t you love having this in your own yard? I know I do. Great photos. 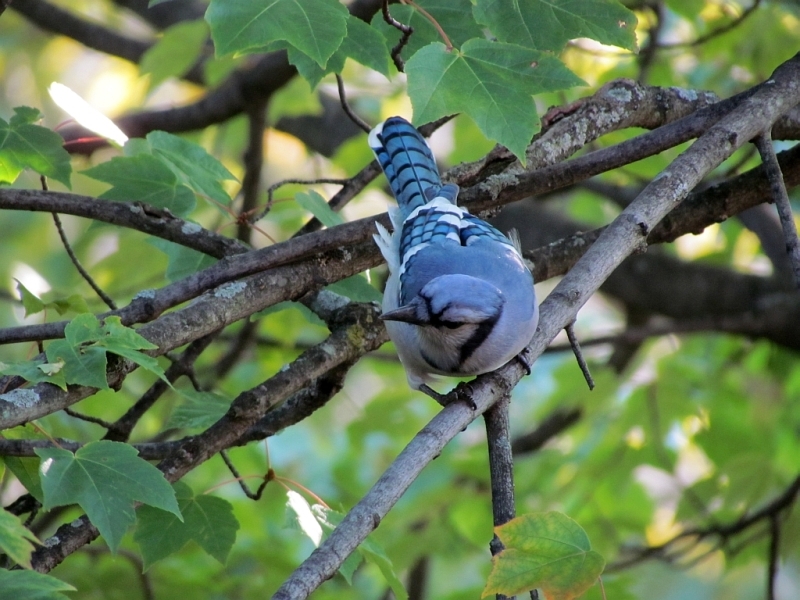 I’ve not seen our blue jays lately. Hopefully they will return as the temps start to drop. What a great set of photographs. Your colourful birds leave ours in the shade. Happy New Year to you too! Looking forward to more of your posts and photos in 2012. 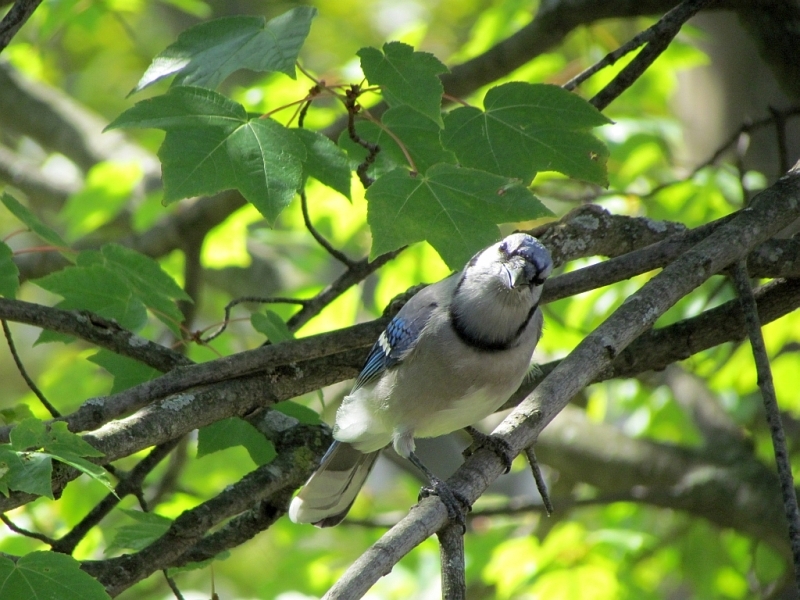 The fifth Blue Jay picture was the best out of the whole series, what with the contrast in colors and the way the Jay was posing. I enjoyed the whole post but that picture was top notch. Love the photos and your observations! I have enjoyed your blog immensely and look forward to more in 2012. Happy New Year, Tracy! This is a great series of photos and a very enjoyable post! 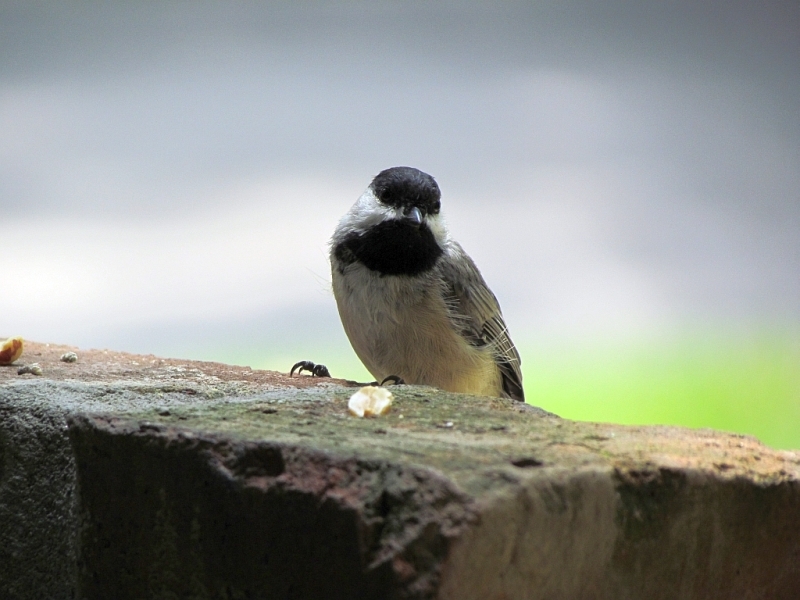 What would we do without the birds and other small critters! Great collection of photos. 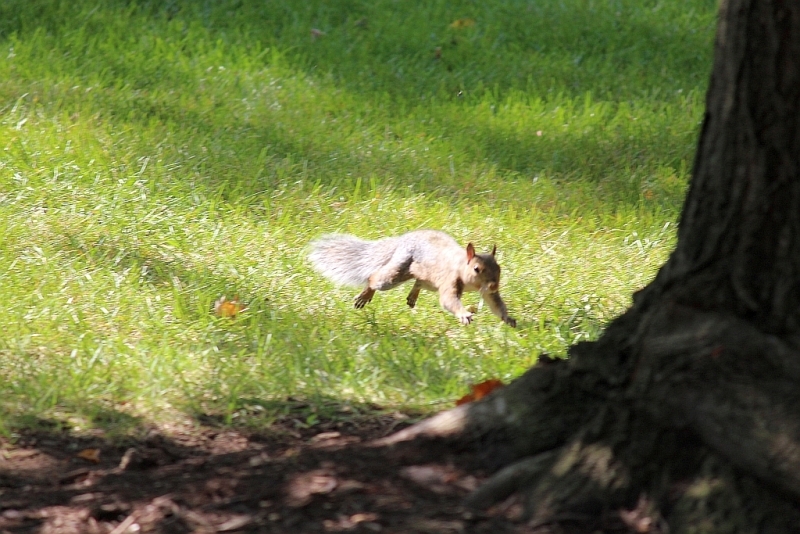 I particularly enjoyed the squirrels (and the one with the nut in his mouth). We don’t see squirrels often out here, and I miss them. 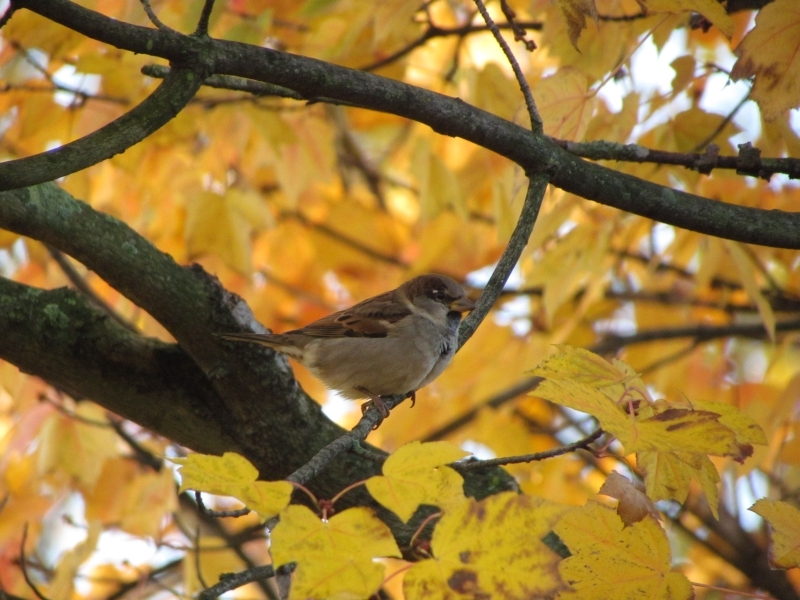 Wonderful sets of photos, Happy Birding in 2012! 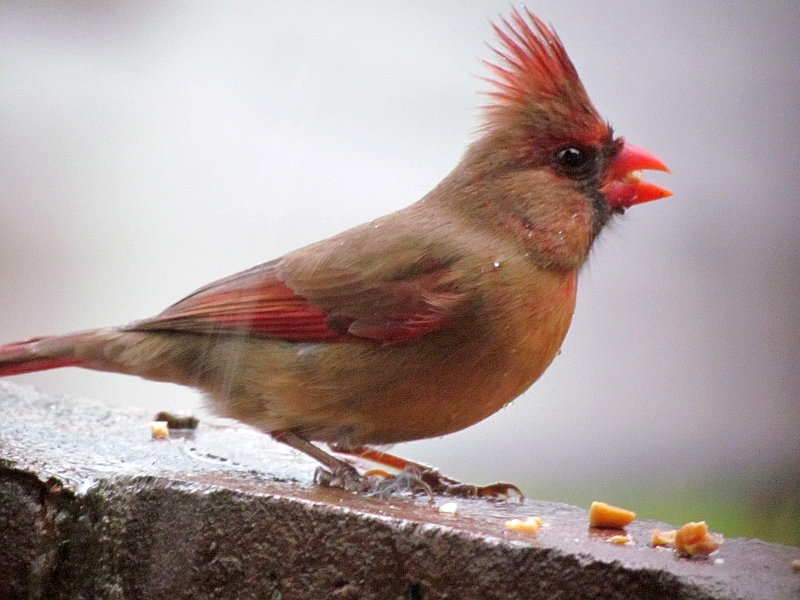 I am convinced squirrels are really ‘hams’… I loved all the shots, but I absolutely LOVED beyond belief, the female cardinal with her crest up, in profile… What A Shot!!! !